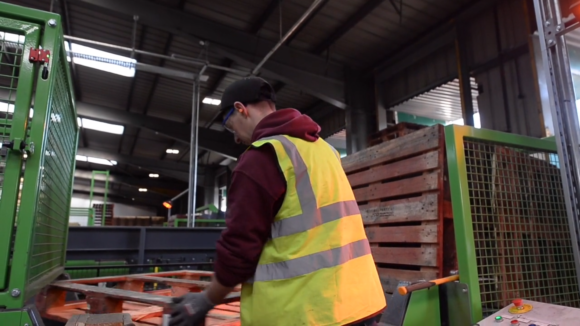 Europe’s leading pooler and manufacturer of wooden pallets has committed more than £2.5 million in a new automated pallet inspection and repair service centre in Leicestershire which will initially process more than three million reusable pool pallets each year. IPP Logipal, which has its UK and Ireland base in Coventry, has signed a long-term lease on the premises on the Interlink Business Park in Bardon Hill, Coalville, near junction 22 of the M1. It is the biggest IPP service centre of its kind in Europe and reinforces the company’s commitment to the circular economy, its business model which promotes the recovery and continual re-use of durable pallets and boxes. The new automated system will process in excess of 700 pallets per hour – a capacity of an incredible six million each year. IPP has entered into a long-term agreement with the James Jones Group, one of the largest timber processing groups in the UK, to operate the new state-of-the-art site, which will replace an existing facility at nearby Glenfield. Phil Storer, UK director of IPP, said: “It’s fair to say 2018 surpassed our expectations in terms of growth and attracting new customers, so we’re in an excellent position to make a commitment on this scale. Gil Covey, executive chairman at James Jones & Sons (Pallets & Packaging) Ltd, said: “We have built a strong business and excellent reputation for service and quality in the field of pallet inspection and repair operations and we are delighted the close working long-term relationship we have developed with IPP has now led to James Jones taking over operations at the Bardon Hill site. IPP is the only pallet pooler to be able to manufacture its own products, as well as retrieving, repairing and repatriating pallets. For more information, visit www.poolingpartners.com.